Birungi, J. and P. Arctander. 2000. 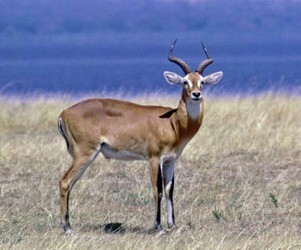 Large sequence divergence of mitochondrial DNA genotypes of the control region within populations of the African antelope, kob (Kobus kob). Molecular Ecology 9:1997–2008. Birungi, J. and P. Arctander. 2001. Molecular systematics and phylogeny of the Reduncini (Artiodactyla : Bovidae) inferred from the analysis of mitochondrial cytochrome b gene sequences. Journal of Mammalian Evolution 8:125-147. Gatesy, J., G. Amato, E. S. Vrba, G. Schaller, and R. Desalle. 1997. A cladistic analysis of mitochondrial ribosomal DNA from the Bovidae. Molecular Phylogenetics and Evolution 7:303-319. Hassanin, A. and E. J. P. Douzery. 1999. The tribal radiation of the family Bovidae (Artiodactyla) and the evolution of the mitochondrial cytochrome b gene. Molecular Phylogenetics and Evolution 13:227-243. Vrba, E. S., J. R. Vaisnys, J. E. Gatesy, R. Desalle, and K.-Y. Wei. 1994. Analysis of paedomorphosis using allometric characters: the example of Reduncini antelopes (Bovidae, Mammalia). Systematic Biology 43:92-116. 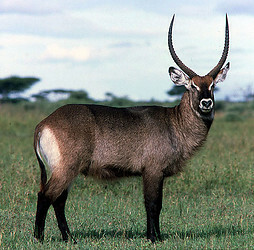 Waterbucks prefer habitats with plenty of cover and will die if denied access to shade. This is a mature male; females are hornless. Page: Tree of Life Reduncinae. The TEXT of this page is licensed under the Creative Commons Attribution-NonCommercial License - Version 3.0. Note that images and other media featured on this page are each governed by their own license, and they may or may not be available for reuse. Click on an image or a media link to access the media data window, which provides the relevant licensing information. For the general terms and conditions of ToL material reuse and redistribution, please see the Tree of Life Copyright Policies.